After the release of the 2015 USA Away Jersey, we now know one of the jerseys the US Women will wear at this summer’s World Cup in Canada. 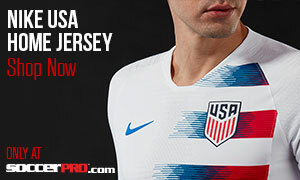 This sparked my interest in what past USWNT jerseys had looked like, which spiraled into a deep dive into their performance at each tournament since its inception in 1991, which turned into this post. Hope you enjoy this look into the past, just months before the US Women start play in Canada 2015. You’ve heard of a double-edged sword, but what about a triple? And how would you defend yourself against it? Answer: You don’t. At the inaugural Women’s World Cup (only 61 years after the first men’s tournament!) in China, the USWNT had one such Triple-Edged Sword in forwards Michelle Akers, Carin Jennings, and captain April Heinrichs. That trio combined to score 20 of their team’s 25 goals throughout the tourney, with Akers winning the Golden Shoe (most goals) with 10. Jennings took the Golden Ball award for best player. The United States reached the title game with ease, dispatching Chinese Taipei 7-0 with five (!) goals from the merciless Akers, and then a 5-2 smashing of the Germans. Their superior athleticism was simply too much to handle. Until the final against Norway, where a 1-1 tie was taken into the 78th minute before Akers played the hero by capitalizing on a Norwegian mistake for her second goal of the match, handing the Americans the trophy. If you were wondering, yes, Mia Hamm, Brandi Chastain, and Julie Foudy were on this team, just not as its stars quite yet. Four years later, the USWNT arrived in Sweden dead-set on defending their World Cup title. Hamm, Foudy, Kristine Lilly, and new keeper Brianna Scurry had begun to make the team theirs. 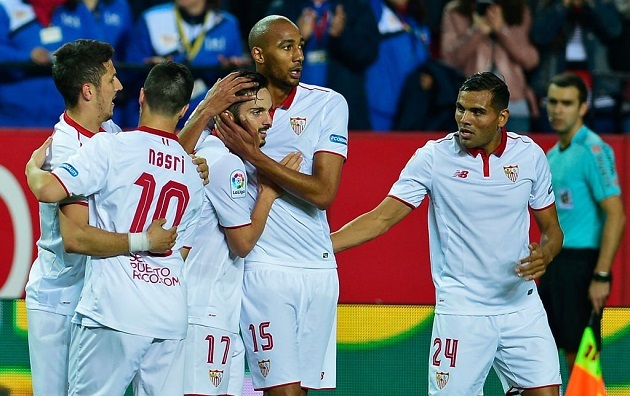 Despite their status as top dogs, China scored two unanswered goals to earn a 3-3 draw in the first match. After winning all six matches in the previous World Cup, they had already dropped points. Still, they trounced Japan in the quarters, and then came up against the talented Norwegians. Unfortunately, a tenth minute Norway goal would remain the crucial decider, as the United States failed to find an equalizer. After they won the 3rd place match, the Norway team they fell to went on to win the final — a small consolation for the US Women. Women’s soccer truly was on the rise now. 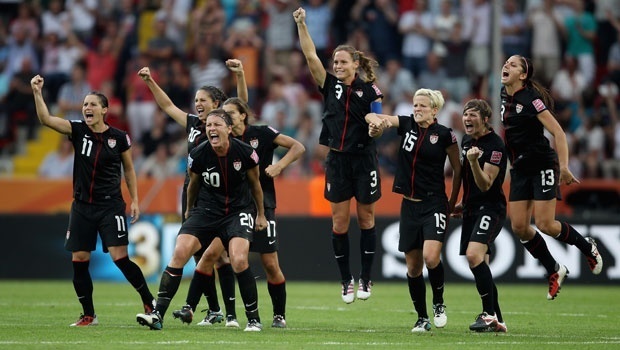 The next summer, at the Atlanta Olympics, women would compete for Olympic medals in soccer for the first time. The US Women took gold, exacting revenge upon China and Norway. Now we come to the tournament that changed it all. Before it, the women’s team didn’t yet have much visibility in its own country. After it, heroes and role models would emerge that would inspire a generation of young players. 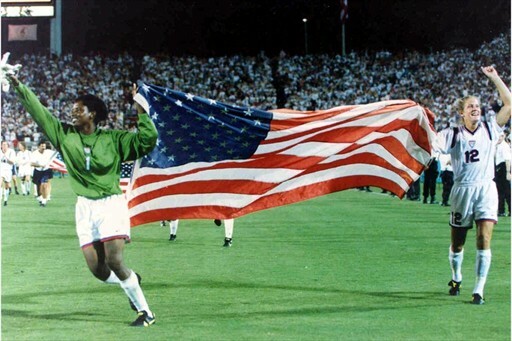 Of course, it helped that the 1999 Women’s World Cup was set in the United States. The USWNT went from playing in front of a few thousand fans four years ago in Sweden to running out to over 90,000 screaming fans at the Rose Bowl in the final — still the single largest women’s sporting event in history. The women kicked off this World Cup by slaughtering their group with three easy victories by a combined score of 13-1. After dispatching the Germans 3-2, they took out Brazil, another soccer-mad country, in the semis. China and their mercurial forward Sun Wen challenged the Americans for the title. Both teams had found the back of the net multiple times per game to make the final, but somehow neither could score in 120 minutes. The defenses were rock solid, with US star Kristine Lilly making a miraculous clearance off her own goal line in extra time. In penalties, Scurry made a crucial stop on one of the Chinese kicks; Mia Hamm followed by finishing hers, thus setting up Brandi Chastain. You obviously know the rest, because it’s one of the most indelible moments in American sports history. Chastain scores, yanks her shirt off, and jubilation ensues. After the 1991 World Cup victory, Hamm said: “No one met us at the airport, there were no ticker-tape parades… One of our sponsors took an ad out in the papers to let people know we had won.” Well, this one was different. The whole country celebrated with them this time. Due to China’s SARS outbreak, the USA held the 2003 World Cup just four years after they hosted the previous edition. Again, they won their group in a landslide before beating Norway in the quarters with an early goal from a young striker named Abby Wambach (who finished her first World Cup with three goals). However, the semifinals saw a remarkably tight match against Germany. After going down 1-0 in the 15th minute, the Americans fought for an equalizer but came up short, allowing two injury time scores to make the final score 3-0. After taking third over Canada, Hamm, Foudy, and Joy Fawcett all had played their final World Cup matches (although they would all go on to win the 2004 Olympics). 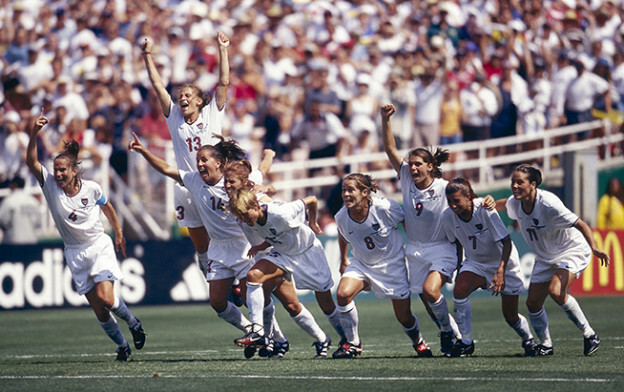 The tide was shifting from the golden generation that won the ’91 and ’99 titles to a new crop that would keep the USWNT more than relevant. China got the chance to finally host the Women’s World Cup four years after tragedy forced it to move away. Once again, the USWNT topped their group in fine form. They rolled past England with goals from Wambach, Shannon Boxx, and Lilly. With another tough semifinal assignment against Brazil, the US Women fell apart, losing 4-0 due to two goals from Marta (you have to watch this one), who would go on to win the Golden Shoe for best player. This time they were soundly beaten by a better team. It wasn’t without controversy though. Coach Grey Ryan had decided to bench young upstart goalkeeper Hope Solo in favor of World Cup hero Scurry, and, shockingly, this didn’t sit right with Solo. Her postgame comments were, um, tactless, to say the least. However, the position would become hers in the next World Cup after Scurry retired. Boxx, Wambach, Carli Lloyd, and others now had valuable experience for the next few major tournaments, including a gold medal at next year’s Olympics, also held in China. Set in Germany, the 2011 Women’s World Cup looked quite different from the meager beginnings in 1991. Money had continued to flow into the game, providing more talent and competition from nations who weren’t players when the World Cup began, such as England, Japan, and Australia. However, it was a rematch between two titans in the quarterfinals, USA vs. Brazil. In possibly the most dramatic World Cup quarterfinal (men or women) ever, it looked lost for the US Women more than once. Rachel Buehler was sent off in the 65th minute, forcing the Americans to play the rest of the match down a player. After two Marta goals put Brazil up 2-1, time dwindled away in injury time before Megan Rapinoe whipped in a pitch-perfect cross to Wambach’s head who drove it home to knot the match in its dying embers. The USWNT prevailed in the shootout, advancing into the semis, where they ousted France 3-1. This set up a final with soon-to-be-rival Japan in another cracker of a match. Super-sub Alex Morgan struck first in the 69th minute, but Japan tied before full time. Then, Wambach headed a Morgan cross in for the certain World Cup winner… until Japan tied it yet again in the 117th minute, sending us to penalties once again. This time, the USWNT couldn’t rise to the occasion, finishing runner-up in their first finals appearance since 1999.